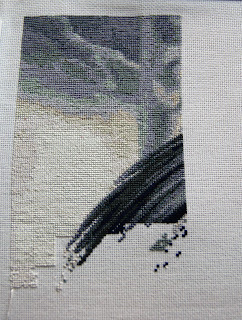 I have some progress to show...although it doesn't look like much, I've actually doubled how much I had stitched before. Miss Pollyrose (my dance partner when DWTS is on) got curious and had to see what was propped up on her window seat (for the best natural light) when I was taking the progress pic. I LOVE this pic! So I had my rubber arm twisted to join the New Start SAL on the HAED BB!!! I will be starting Ganesha. He will be stitched on 22 count Hardanger, probably 2 over 1 full crosses! I will update this post with the after! Tomorrow starts the year's first New Start SAL, along with the Retired Artists SAL. So, who here is making a new start? If you're joining in the SAL with a new start post a link here to your chart (on the HAED site). We want to see! I am continuing work on the retired LR chart Goblin Tree. I'm trying to finish it this year. So I'll be drooling over your new starts! Also, just wanted to let you know that I am still working on the Member/Buddy lists. We have 5 more full member openings available. I am going through the requests in the order in which they were received. I email the requestors (in order) and have to wait to hear back from them (or not!) on whether they are still interested in becoming members. So it's an involved (long) process. 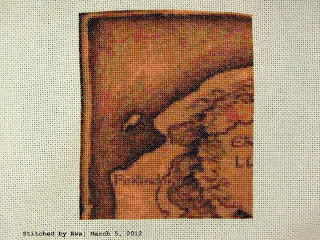 Finished page 2, it is stitched on 20 ct. evenweave, 2 over 1. Michele's charting is really good on these blues. I hope you are enjoying Spring, we are raising chicks right now while waiting for the snow to melt! Happy Stitching everyone!!! 2 pics, a close up of the page I finished and an overview. I am keeping this in rotation for the time being as I seem to be pretty much stuck into it and making progress. More progress has been made. I love the colors of the books - I wish they were on my shelves. Can't wait until I get to the dragon. For Christmas I received a RAK from Liz, over on the HAED BB. It is Mini Gypsy Firefly, straight from the top of my wishlist! I started on Christmas Day, but after a couple hundred stitches I decided I didn't like the way it looked. Restarted in tent, but didn't like it either. Retarted on a totally different fabric and count and thought I could live with the results. Nope. So now I've put her away to cool off until I get a new piece of fabric. I really hope a fresh start will keep my love of her alive! Meanwhile, Lady Godiva insisted on some attention! Here she is where I started back last week. I am a slow stitcher, but hopefully I'll find my way back here much sooner with an update on her! Happy stitching to you all! Aaaaaaaaaaaaaaaaaaaaah. Still nothing. Worked for several hours on Sat/Sun, only to realize on Sunday that I'd hopelessly miscounted and didn't know where it began. Fortunately, I really hadn't done that much, but still, to go back to the beginning . . . . Hours of pulling & cutting stitches out, so still nothing picture-worthy. Hopefully I will have better luck next weekend. I'd reallyreally like to get this project going. Hello! I love the way it is and I'm coming porfin face, I have wanted to ask that pretty face you have. I'm continuing work on it this week. It has been a long while between posts because I had a disaster happen. I lost my glasses I use to do craft! I spent a few days looking for them, then I ordered another pair via zennioptical.com I went crazy while I was waiting and managed to do some of the black on the right hand side. The glasses arrived today so I will be able to do my beloved cross stitch again! Here is Smartie Pants Pink.I started her in February and I only stitch her at weekends.She is stitched on 18 count aida 2 over 1. Sorry its been so long since my last post! But Since then I have 2 HAED Finishes! I gave this to a friend for their birthday in December! 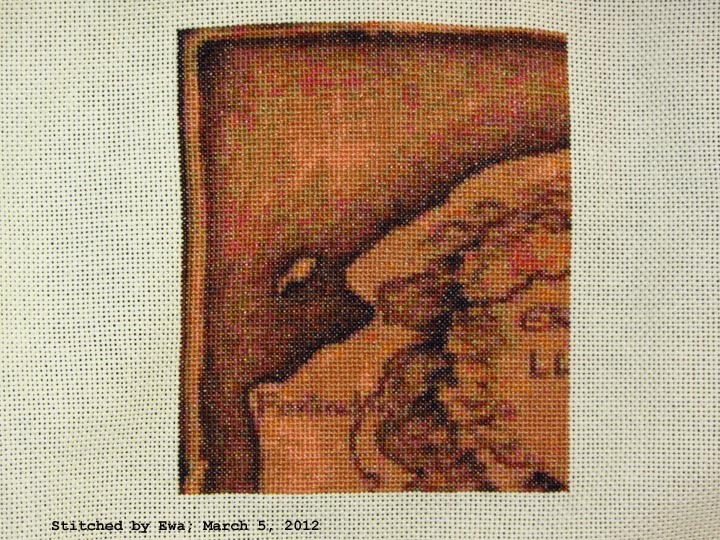 It took nearly 10 months, and that was stop start stitching as well! This took nearly a year to complete! Both were stitched on 18cnt Aida using 2 Strands! I also have brought a heap of new charts! Damn those sales! Not that I mind! 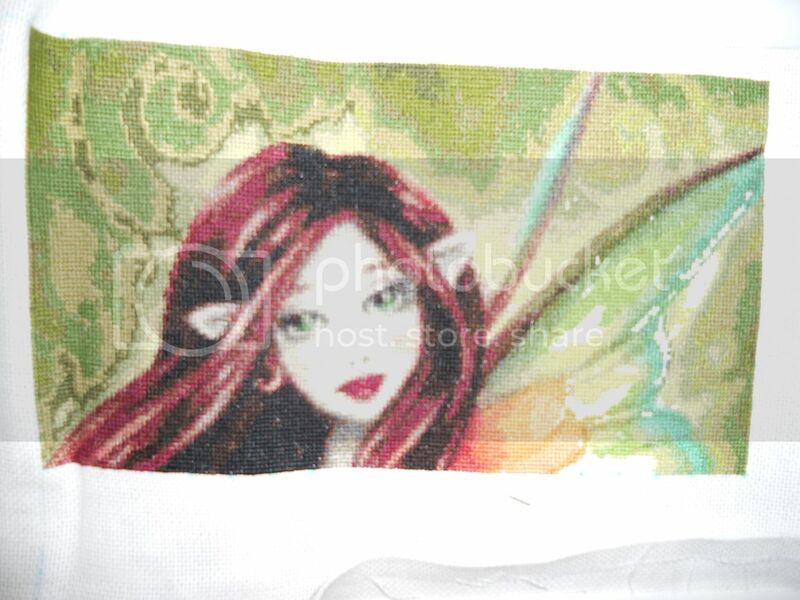 On Friday I did put some stitches into "Envy" Although I'm not moved to stitch her ATM. and this is my progress after 2 or so sessions. So she will go into the semi rotation I have going! 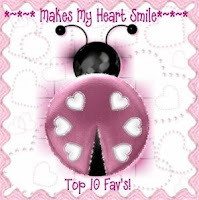 Sorry its been so long, I do keep checking the blog to see what everyone is up to and It wont be so long between post this time! Promise! 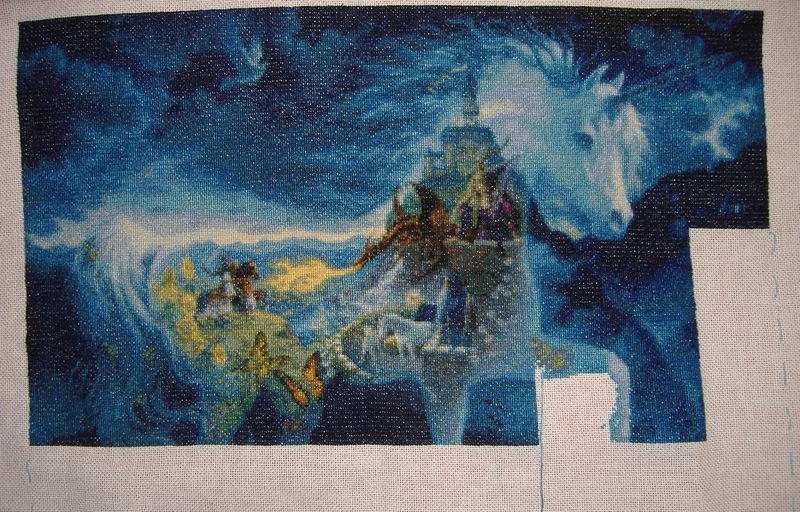 The Unicorn is progressing nicely, the only thing missing from this page is a small part of the background. 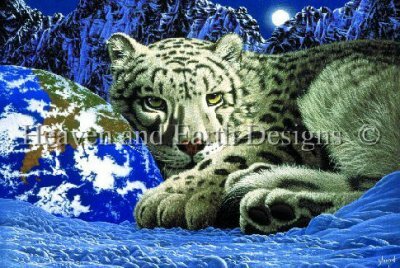 Just an update--I've been meaning to start "White Tiger" by David Penfound. I have yet to figure out how to get pictures up, but since all I have are the materials and the fabric, and no stitches, there isn't much to see. Kinda busy with school right now (end of final semester of the final year, with the Bar Exam in July), but I'll try do do at least a little and keep everyone posted weekly. It's a gorgeous design--I'm doing it on a very pale blue-gray 22 count jobelan-esque fabric (don't remember the name). Should look lovely!! (I hope). Just finished page 6 of College of Magical Knowledge. full crosses, and it's now about 30% done! Thanks for looking and happy stitching. It's been so long since I've posted that I hang my head in shame. But I've made a new start on a new project and there's a little progress to show you. Not much...a little more than 500 stitches. But here it is! Touching the Hem of God by James C. Christensen. I love all the lavenders--which is a good thing because most of the design is lavender background. I'm working one over one, full cross, on 25 count lugana. I'm surprised at how easy it is! The thought of working on such a high count was so daunting that I only worked on 18 count before. It's good to be back. The stitching you've all posted is beautiful! Thanks to Louanne for updating our membership, which is what motivated me to get back to stitching. 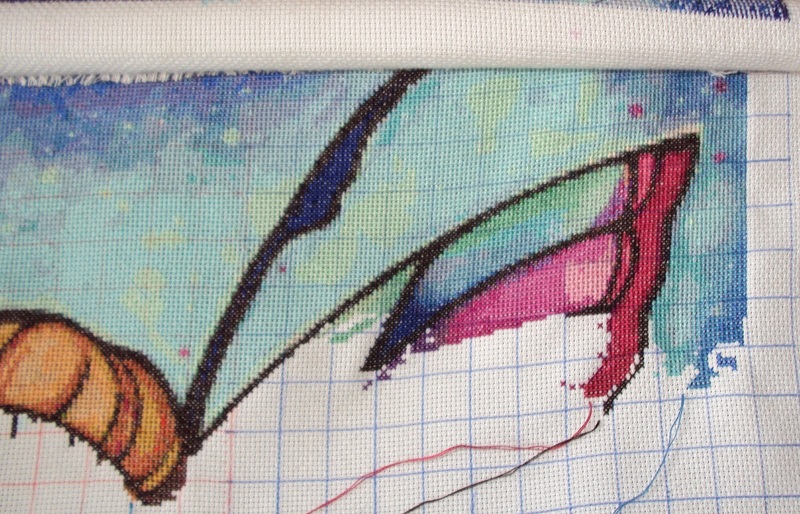 I can't tell you how glad I am to get my stitching mojo back! Please, please, please, add your name to the body of your email when mailing in a post! We don't know who posted what, if you don't sign you name. 12 pages completed. 4 more to go!! I know I know. It's been a while since I posted. I finally picked The Astronomer back up. Here is where I was on Wednesday when I started again. And this is where I ended last night. I got most of the top of the cage in. I have about a column and a half to do on this page and then on to page 7. I hope to be on page 7 by next weekend. Lots and lots of black on the next page. Good thing I picked up several skeins. Last night I finished page 6 and Semiyar is now the proud owner of a totally stunning face! I'm totally in awe of how beautifully his face has come out but it's left me with a niggle through. Seeing how flawlessly his face is blended why is the background so patchy.... is it because there are only 20 odd colours in the palette that had meant the background can't be blended more as there aren't enough colours to do so? I've messaged Michele at HAED to see what she says about it but I'm just glad that the appearance of his face actually draws your attentions to Semiyar himself and away from the background so it doesn't look half as bad as it did before but it's still a real shame! Labels: Now you can see all the picture. I love it. Here is my progress halfway through page 5. It's been long going - I moved house! Sorry for the slow updates. Avarice by Marta Dahlig, stitched one over one on 25ct Lugana. Next update when I complete the page. So in the time since I last shared my progress on my projects I have become a full posting member! Thanks Louanne! So it has been a long time since I have updated on my projects, I have been doing a little on alot of different ones. So I will stick with the most recent ones! Sorry about the blurryness of the photo! 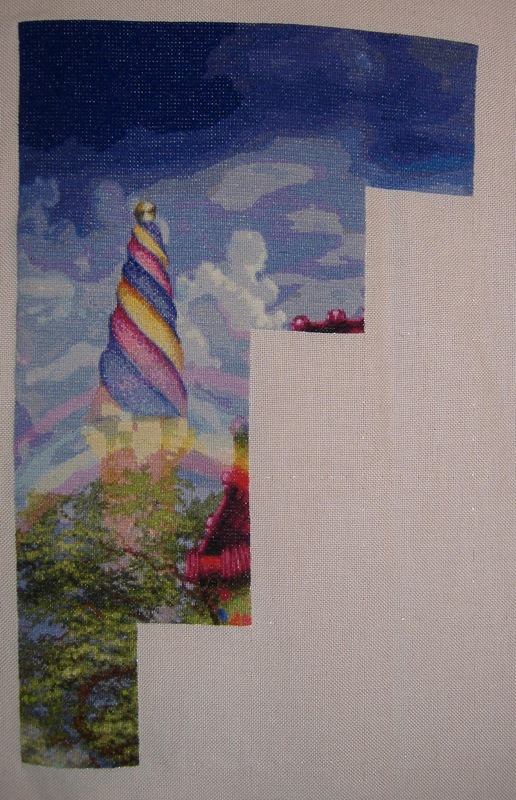 I am so close to finishing the top row on this, next time for sure! I am really liking how this guy is turning out! Can't wait for his next turn in the rotation! 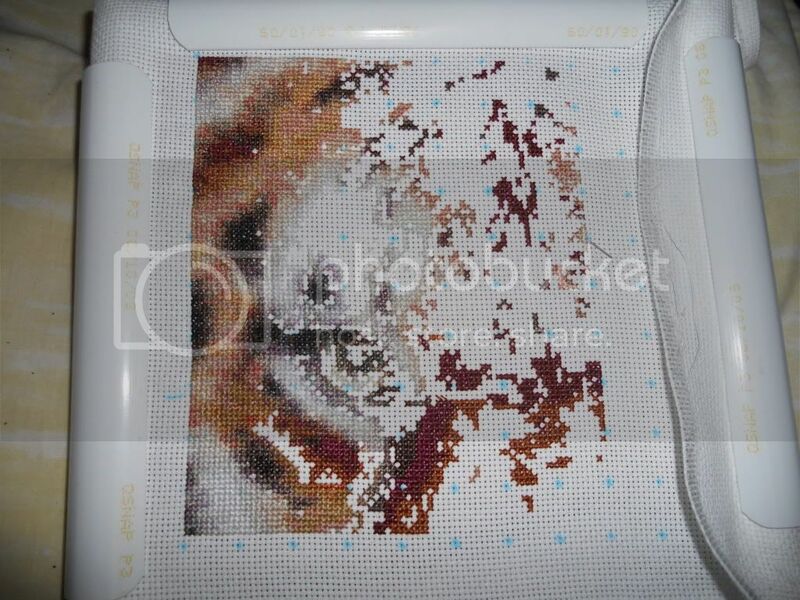 This one I'm stitching when I go away from home.... It's the little one I have for taking away with me. 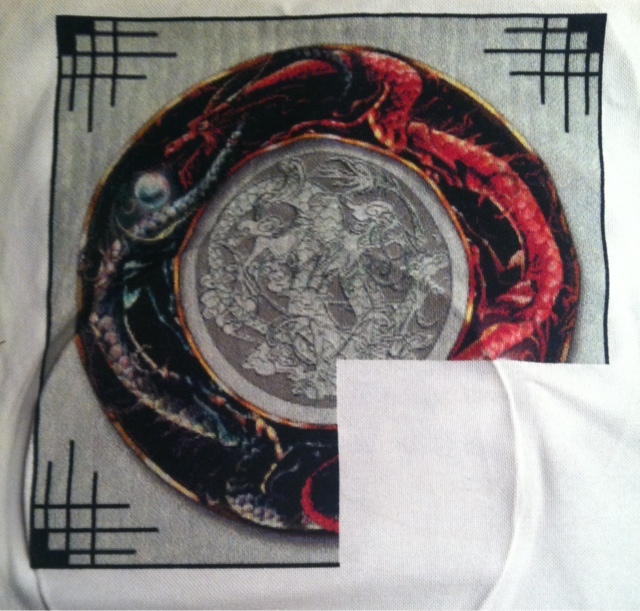 I've been stitching this for 51 hours now. I think colors are really beautiful.... hope you enjoy with WIP. Here's a new update of Treasure Quest! 696H already and starting page 16. Hope you like it... I'm working really hard on it. 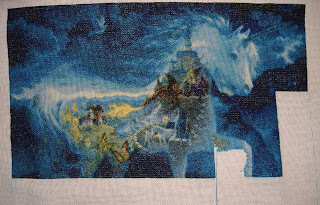 I wanted to post my progress of page 1 of Middle Earth. I'm stitching it on 25 count antique white evenweave, 1 over 1 with DMC threads. a surprising amount of confetti! soon. Until then, happy stitching! Just a quick update on Felicia by Hannah Disney. It is stitched on 18 ct. baby afghan fabric--not the best choice-- but I needed an inexpensive large piece of fabric. I love the tie-dye effect in the design. 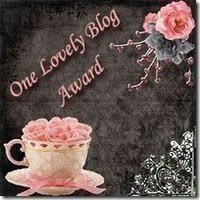 I'm Kathleen--new to HAED and to this blog. Excited to be here, and to share my love of all things cross-stitch with all of you. 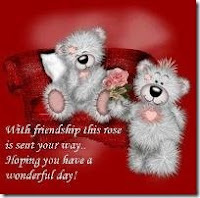 Have a great day--I look forward to 'meeting' you all! Pay no attention to the wrinkles. I was trying to get a pic in sunlight, and I couldn't flatten it out that well. Since I finished page 14, I figured it was time to take it off the rods and get a full pic. You can see I've started page 15. Pages 15 and 16 are the last full pages to be stitched, after that there are only 4 half pages to go. If I can concentrate on this, I may be able to finish it this year! 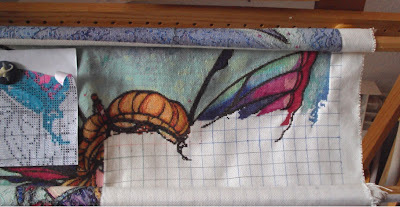 Here's my latest progress shot of Faerie Melody after 12 pages (3 columns of pages). The next column should reveal the faerie herself! Going to work on Mini Semiyar for a while before coming back to Faerie Melody. I am very pleased with the progress of this week, I have wanted to see the wing and face!! I've finished one more page. Only 5 more pages to go!! I am looking forward to finishing this project this year! During the last months I have spent my little free time in various charts, but I have no great advance in any of them. 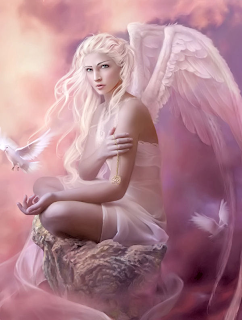 In Angelic progress has been on heaven, the face will be the next step. I finished another page of Queen of Hearts. I also started Faces of Faery 75, on Lugana fabric 2 on 1, but I didn't like the result and I undid it to restart it 1 over 1. 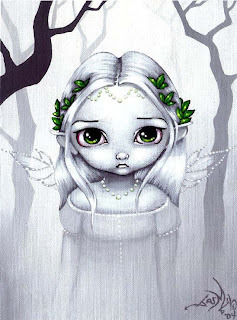 And fnally a few weeks ago I decided to start The Last Leaves, another design of Jasmine Becket Griffith but my progress has been very small and most of it in white colour. 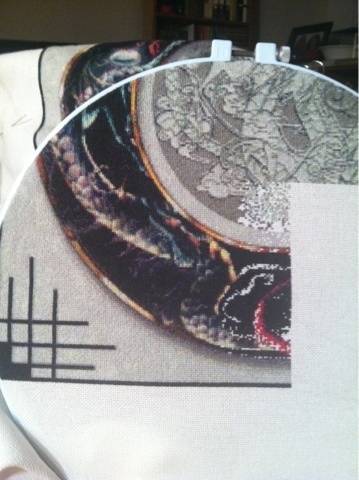 I'm doing in Lugana fabric, 1 on 1.